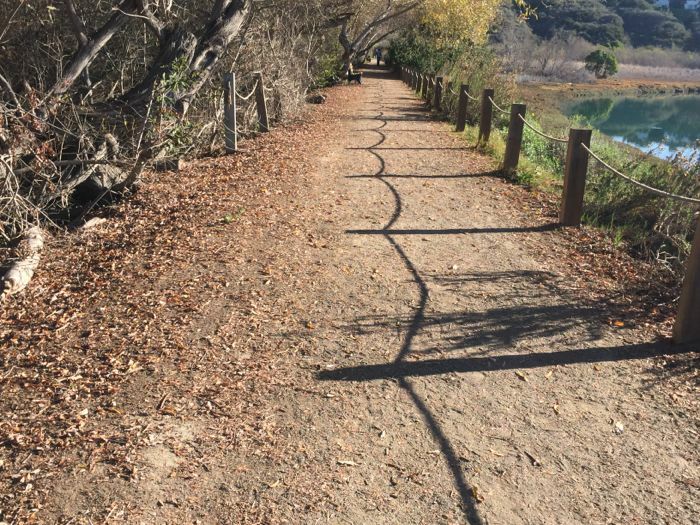 Looks like a great trail for a walk. Nice shadows! It really is! It's convenient, comfortable, the views are beautiful. And there's an interpretive center, too. And those shadows! I love the graceful swoops of the rope shadows. Stunningly beautiful, and inspirational. Clearly I've got to break out beyond my daily routines to see more, and photograph more! Just lovely. You probably do have some idea what it means to discover seven comments waiting in the inbox of a blog... Amazing. Honestly, after devoting a great deal of time to writing for a token sponsorship, and realizing that I am literally working for chicken feed ( about 3.50 an hour?) then seeing NBC lauding the "Top Ten Latina Blogs," which I am not, I thought: *Expletive! * I quit! This is absurd. Blogging is for corporations, and a handful of successes. Why do I try so hard?? It's embarrassing. But... you saved me. Maybe blogging is absurd, but I really love it when I can make a connection. And it's even worthwhile to hope I can help out some enterprising young people move their dreams forward. Thank you, for connecting with me, friend. I feel a lot less like an utter dork.